When the West Coast’s prized rap possession Tupac Shakur was murdered in September 1996 riding passenger-side with the leader of Death Row Records, Suge Knight, the world bore witness to one of hip-hop’s most painful losses to date. But after 21 years of arguable statements, conspiracies, documentaries, debates and finger-pointing, Knight has now stepped forth to disclose the two individuals responsible for the fateful evening of September 7, 1996. Several sources have reported that in an officially signed affidavit, Thaddeus Culpepper, Knight’s attorney, wrote that the label CEO has “known for many years that Reggie Wright Jr. and his ex-wife Sharitha were behind the murder of Tupac and attempted murder of Knight.” Wright Jr., the then-head of security for Death Row, had previously been linked to Pac’s death by a former LAPD detective Russell Poole, along with Knight’s ex-wife. However, Knight was the intended target of the shooting, as Poole believes the two conspired to murder him to gain control of Death Row Records. Knight seconds these claims, as the “salient points” of the new Tupac Assassinaton: Battle of Compton documentary was what reportedly convicted him to disclose such classified information. Knight, who has been incarcerated since January 2015 on murder and attempted murder charges for a separate incident, has also long been suspected and accused of Pac’s death due to inconsistent testimonies, one of which he suggested Pac faked his own death. The affidavit also claims that he has knowledge of those involved with the murder of Tupac’s most-spotlighted East Coast rival, Notorious B.I.G, as well. If there's truth to Knight's claims, hopefully his latest reveal will move everyone closer to solving the cold case of the legendary rap prophet's death once and for all. 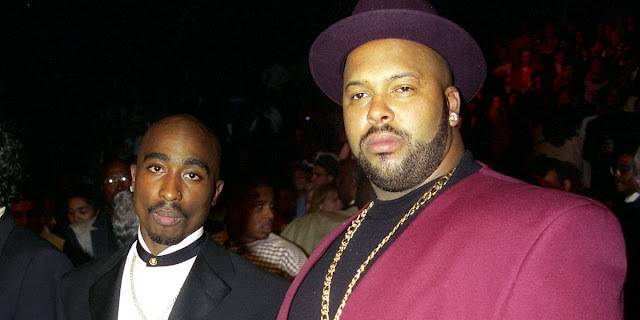 Marion 'Suge' Knight claims that his ex-wife and former Death Row Records security chief Reggie White Jr killed Tupac Shakur, and insists he was the real target of the 1996 drive-by. He added that Knight also had alleged details of Wright's involvement in the Bigge Smalls murder case. The rapper, who until now has always refused to identify the shooter, appears to have spoken out after hearing the 'salient points' in the new documentary Tupac Assassination: Battle for Compton. 'He admitted to Culpepper that the theories in the movie were true,' a source said. Suge was so intrigued he sent his private investigators, to discover how the writers and directors found out about what happened. The documentary also claims that Suge had always been the real target of that fatal shooting. Tupac was just in the way. The film tells of an attempted coup at Tupac's label Death Row Records - co-founded by Suge and Dr Dre among others - which eventually led to the shooting in Las Vegas on 7 September 1996. 'Culpepper told Carlin individually that not only did Knight confirm the events as portrayed in Compton, which portray Knight was the intended target and Shakur as collateral damage, as true, but also goes on to allege that these 1996 events may have been the first in a history of attempts on Knight's life, culminating in the recent attempted killing of Knight at the 1OAK Club in Los Angeles, where Knight was shot six times,' a film spokesperson told Music News. Knight was also the target of allegations that he was responsible for the shooting of Shakur's rival Christopher 'Biggie Smalls' Wallace in 1997. The film features Culpepper's signed affidavit - which was taken by former LAPD detective Russell Poole on July 18, 2015. Poole, who also contributed to the book, appears to agree with Suge's theory. He told Vice in 2015 that Wright Jr. and Suge's ex, Sharitha Knight orchestrated the murder to assume control of Death Row Records. 'Suge wasn't divorced yet and if he died in that hit, she'd get most of everything,' Poole said. 'So she went to Wright Jr., who was in charge of Death Row and ran it while Suge was in prison. White Jr responded to the claims in 2015, after Poole's death, to AllHipHop, pointing out that several people that had accused him of Tupac's murder had died in the past decade. They include the late rapper's ex-bodyguards Michael Moore, Frank Alexander and Poole. Wright warned that the next person could be Tupac Assassination co-director Bond. Suge's marriage to Sharitha Golden, the mother of his first child, was tumultuous at best. Just two years before their wedding in November 1989, Sharitha had obtained a restraining order against Suge. They later reconciled and wed, but got divorced the following year with Sharitha demanding her ex pay $735,000 in unpaid child support. According to his lawyer, Suge believes both Sharitha and White plotted his death together. The shooting of Tupac, 25, has been surrounded by conspiracy theories ever since. They include claims that Tupac faked his own death with the help of the first cop on the scene, Chris Carroll, who is now retired, and fled to Cuba. There were even theories that Suge had ordered an assassination hit on Tupac and that Carroll was involved. Suge, 50, had always denied he was behind the shooting but until now was unwilling to name who it was. Tupac's last public photograph was taken as he was riding in the car with Death Row Records co-founder Suge on September 7, 1996, in Las Vegas. The pair had just left a Mike Tyson fight held at the MGM Grand, when the 25-year-old rapper was shot as he stood up through the sunroof to talk to a group of women while the car was stopped at a traffic light. Shakur was hit four times - twice in the chest, once in the arm, and once in the leg. He eventually died six days later on September 13. Bond believes Suge, who is behind bars awaiting a separate murder trial, is ready to make a statement about Tupac's murder because it proves that he has been a target of gangs out to get him for years. Suge, who was shot multiple times in 2014, has been in jail since his arrest for mowing down two men in a burger stand parking lot in Compton in 2015, killing businessman and friend Terry Carter and injuring Cle 'Bone' Sloan. The two men had been working as security on the location set for the NWA movie Straight Outta Compton and had got into a dispute with Knight earlier in the day. Prosecutors have charged Knight with murder and attempted murder. He has pleaded not guilty and claims he accidentally struck Carter as he fled the scene in fear for his life suspecting an armed ambush. Bond and Carlin insist Knight was a victim in Vegas, which could be evidence of his that he was also telling the truth about his 2014 shooting at One Oak and in the Compton case he is only trial for. New of the potential break through in the now decades-old case, come as Tupac is due to be posthumously inducted into the Rock and Roll Hall of Fame on Friday. The Harlem-born rapper's recording career may have only lasted five years before he was murdered, but it is the rapper's influence from beyond the grave that will be celebrated. Arguably bigger in death than he was in life, Shakur will be only the sixth rap act to be voted into the Hall of Fame in its 30-year history. The Hall of Fame described him as 'an international symbol of resistance and outlaw spirit, an irresistible contradiction, a definitive rap anti-hero. 0 Response to "After 21 Years, Suge Knight Finally Reveals the Two People Who Killed Tupac Shakur"